It is hump day Wednesday once again. The very simple task for this giveaway today is email subscription. Are you ready? Follow the simple instructions posted below and you might win $50 paypal cash. Good Luck! 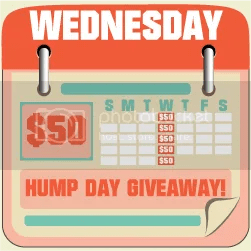 It’s time for Hump Day $50 Giveaway and today’s event is for Email Subscriptions. Thanks again to the 27 wonderful blogs listed below for making all this possible. When you’re done, please do visit their blogs to find the latest news, tips, or deals and giveaways. On the first mandatory entry, please do not forget to write Experience of a Super Mommy referred you since it is a mandatory entry. You must complete the first 2 tasks for 26 points before the others are enabled, and for all your other entries to count. Thank you for the chance to participate and Happy Hump Dayto you too!